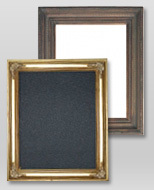 Dark gold painting frames are some of the most ornate frames that we have. Many are dark gold Baroque frames that lend themselves to classic artwork. Regardless of the style you choose, Art Gallery Frames can guarantee the highest quality around, as well as unparalleled customer service. Browse our dark gold frames below to find the right one for your needs.